Fluffy, buttery, cheesy goodness with no carbs?! What?! I had heard rumors about this magical rainbow unicorn situation and finally decided to try it for myself. I am thoroughly delighted with the results, and you will be too. It is 15 minutes to easy cheesy goodness! Yes, there is some butter, but let’s face it, if you had made mashed potatoes you would be eating at least this much butter and probably more (and it makes a LOT so you will not be eating the whole thing yourself in one sitting… we tried.. it doesn’t seem possible). Does it taste like cauliflower? Yes, a little bit, but not overwhelmingly. 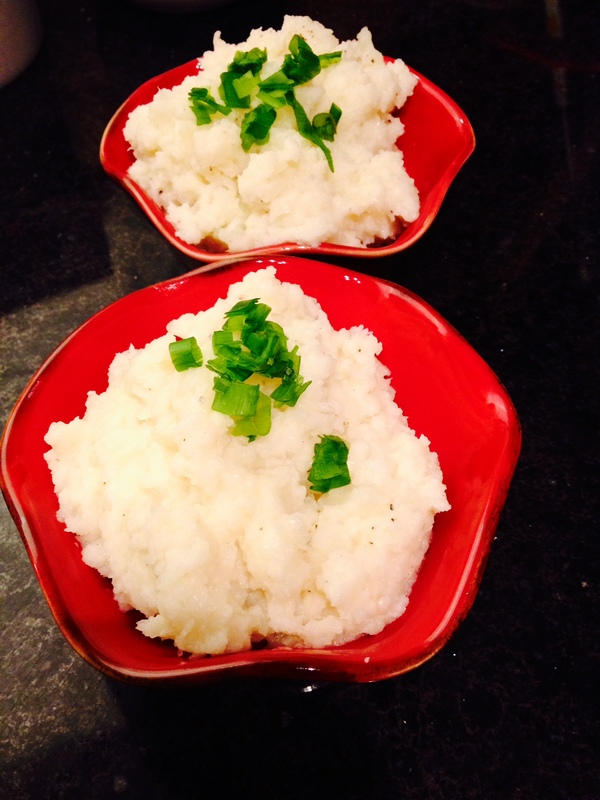 You will almost believe it’s mashed potatoes, really! I may bust this out at Thanksgiving. Hmmm *tenting fingers*. Equipment: Steamer… however you like to steam things. If you’re not sure, you basically want to suspend the cauliflower over some boiling water, in a pot with a lid. You can get a steamer insert for your favorite lidded pot – or there are also inexpensive silicone ones that come in every size (with handles and feet!). Immersion blender or potato masher for mashing and fluffing up the fluffiness. Heat-proof large bowl for assembly. To steam your cauliflower: Put your steaming water on to boil – 2-3 c. of water in the bottom of your steamer (just enough so it doesn’t come up into the steamer basket, but enough so it won’t boil away during the steaming time). Cut out the tough cores and stems from your cauliflower, then cut the rest into medium-size chunks – you don’t need to have individual cute florets for this, you’ll be mashing it so just cut it up enough so it fits into your steamer basket. Once your water boils, add the cauliflower to the basket, cover with a lid, and steam for about 10 minutes. The cauliflower should be pretty soft by the time it’s done – poke with a sharp knife, and it should be soft. It won’t get waterlogged because it’s not actually sitting in the water. To assemble: In a large bowl that can handle some heat, place your steamed cauliflower, grated Parmesan cheese, garlic, salt, butter, and pepper. Now either blend it all together with your immersion blender, or mash the **** out of it with your potato masher! Picture your least favorite person at the moment and put all that into mashing it up. Get it to the texture you like – smooth like whipped potatoes or a little textured like the photo – dish into your serving dishes – and top with sliced chives or green onions. Admire. Pretty! Now enjoy, guilt-free!